Shopify Purchase Management : With Shopify Purchase Management app, merchant can manage and request purchase order from the suppliers. Merchant can create suppliers and can even provide them with the login link. Also all the purchase order in transit can be tracked through incoming shipment. Shopify Purchase Management : With Shopify Purchase Management app, merchant can manage and request purchase order from the suppliers. Merchant can create suppliers and can even provide them with the login link. 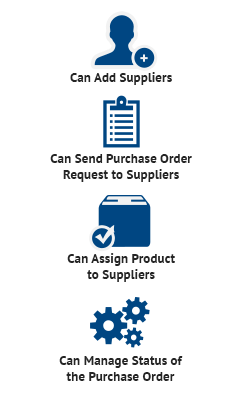 Merchant will be assigning products to the supplier for the purchase order request. Also all the purchase order in transit can be tracked through incoming shipment. Shopify is emerging as a great tool for building eCommerce sites but somewhere lacks in purchase management. We are here to solve that problem for you with one of the most efficient apps of ours “Purchase Management”. Purchase management comes with exuberant features to manage the purchase orders which results in saving time and leads to increase productivity. All the purchase order in transit can be tracked through incoming shipment, which will again lead to enhanced productivity, taking your store to the new heights. Incoming Shipment : Here you will find the list of all the incoming shipment for the purchase order requests. This will list all the purchase orders that are in transit. 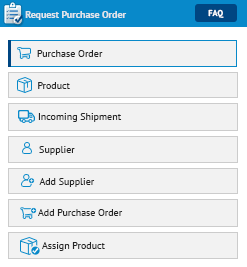 Supplier Panel : From here suppliers can view their "purchase orders" and "assigned products". Suppliers can also configure his details from here. Did you buy Shopify Purchase Management?